Hosting brunch is one of those things that sounds good in theory, but actually can be kind of stressful. If you decide to make something classic like pancakes, you will quickly realize—as you hover over the stove flipping your twentieth pancake while the rest of your guests have already started eating—that perhaps a less labor-intensive meal would have been easier. The secret to a stress-free brunch is simply this: a main dish that is prepped the day before, so all you have to do in the morning is pop it in the oven and get ready for your guests to arrive. 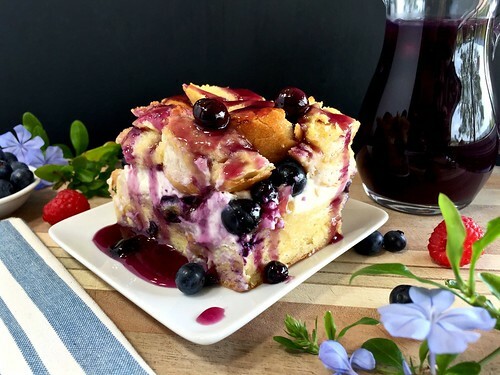 The other secret is to make a crowd-pleasing recipe like this baked french toast, in which crusty sourdough bread is layered with smooth cream cheese and fresh blueberries before being immersed in a delicious maple-flavored egg mixture, then baked in the oven to a golden brown perfection and topped with sweet, homemade blueberry syrup with hints of vanilla. 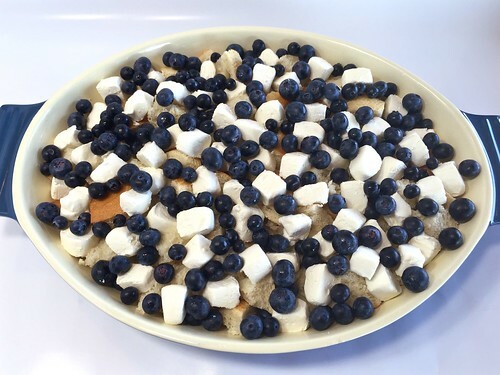 This family favorite is similar to bread pudding with its rich and creamy soft center and crunchy top, but since its only ingredients are bread, milk, eggs, berries, cream cheese, and just a touch of maple, it makes a delicious breakfast that isn’t too sugary. 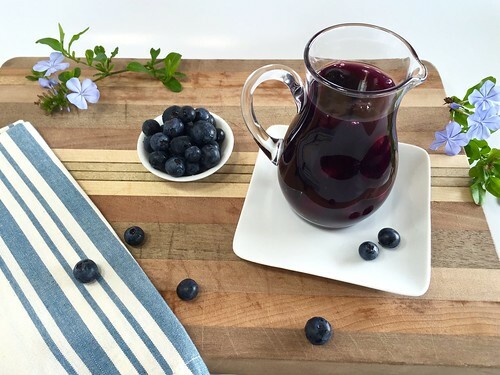 The fresh blueberry syrup adds a sweet fruitiness along with a stunning, deep amethyst color, and since it is served at the table, everyone can use the amount they would like. Ryan’s mom cut this recipe out of the Oregonian newspaper over fifteen years ago, and we have been enjoying it at family gatherings ever since. 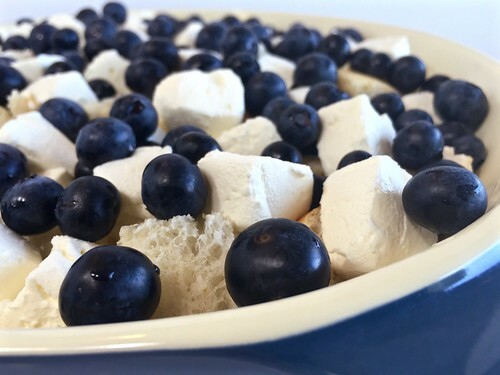 With a delightful flavor and a short prep time, this is the perfect recipe to ensure a relaxing weekend brunch or summer celebration. 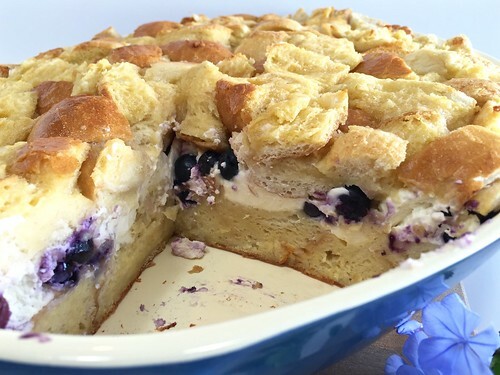 And since it is so easy to make, you might find yourself hosting more often… or at least requested to! 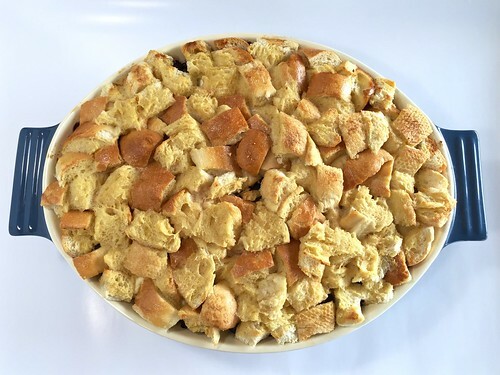 Grease a 9-by-13-inch baking dish, or any other 3- to 3.5-quart baking dish, and place half of the bread cubes in the dish, spreading them into one even layer. 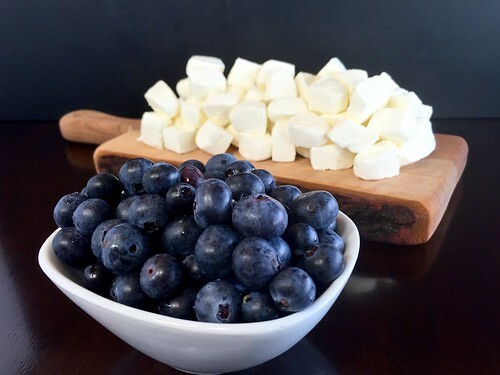 Scatter the cubed cream cheese and blueberries over the bread, distributing them evenly. 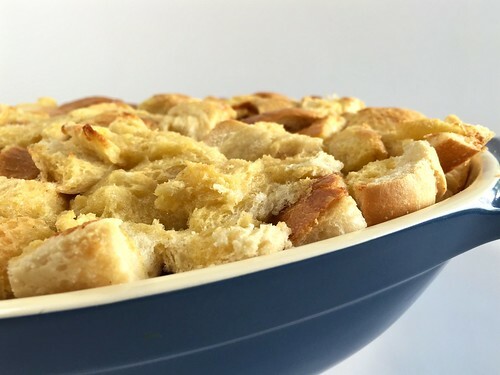 Place the remaining bread cubes over the top evenly, and press down with both hands gently but firmly to fit the bread in the pan. Af first it may seem that it won’t all fit, but it always works out. 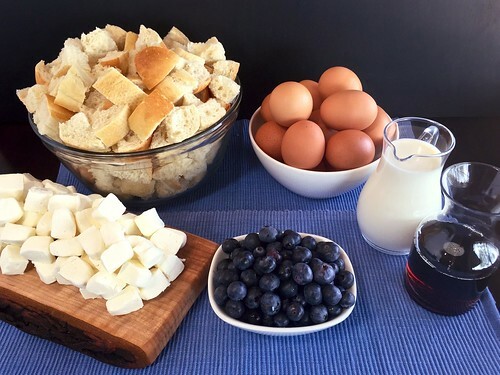 In a large mixing bowl, combine the eggs, maple syrup, and milk, and whisk until smooth. Transfer mixture to a pitcher for easy pouring, and then slowly pour mixture over the bread cubes, ensuring that all the bread gets wet. Especially near the edges, it is very easy for liquid to run off the side of the dish, but just go slowly and don’t worry if a little spills. Once all the liquid is added, cover the dish tightly with foil. Again, use your hands to press down on the foil and saturate the bread with the liquid mixture. Refrigerate overnight. The next day, preheat oven to 350°F. Bake french toast for 30 minutes covered with foil, then remove foil and bake for another 30 minutes, until the top is golden brown and the center is fully cooked. Remove from oven and let sit for 15 minutes before serving. While the french toast is cooling, combine the sugar, water, and cornstarch in a medium saucepan. Place pan over medium heat, and cook, stirring constantly, until the mixture simmers, thickens, and starts to turn clear. 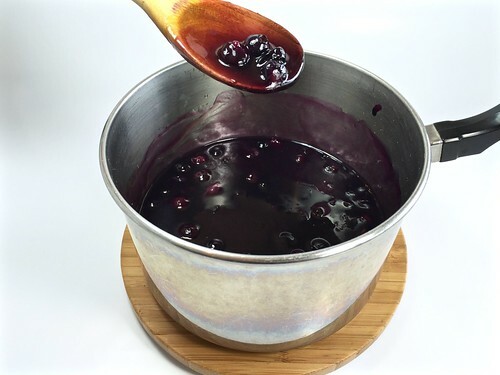 Then add the blueberries, salt, and butter, and continue to simmer, stirring, until the blueberries pop and the syrup is a thick purple color. Remove from heat and stir in the vanilla extract. 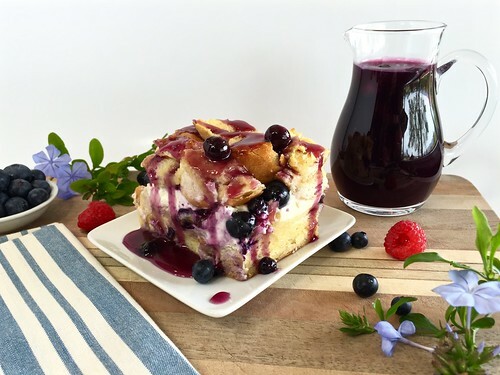 Serve warm, poured over the french toast. 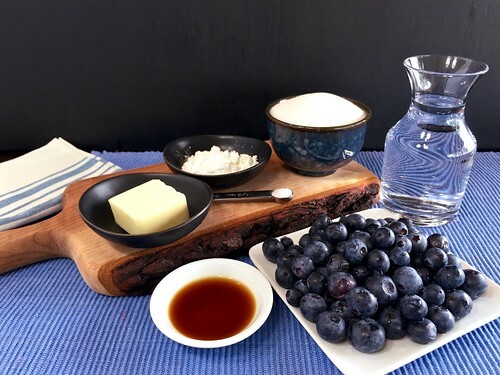 — The blueberry syrup can also be made the day before and refrigerated overnight, just be sure to reheat and stir it before serving, as it will thicken in the fridge.